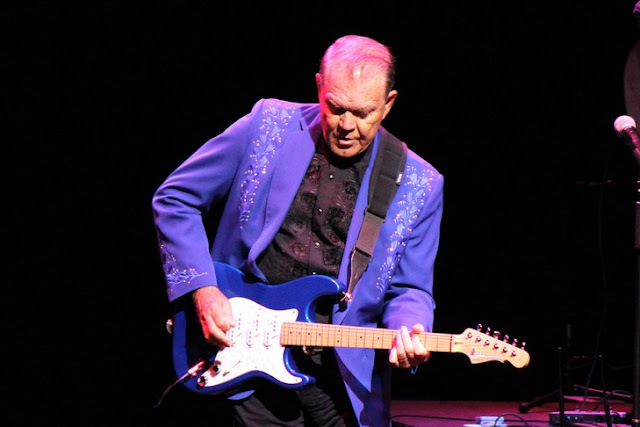 MELBOURNE, Fla.— Country music legend Glen Campbell thrilled his fans at the King Center for the Performing Arts with his career ending “Goodbye Tour.” This was no tearful goodbye, but rather a celebration for a beloved singer who exudes optimism and class. As Campbell took the stage wearing his signature rhinestone highlighted jacket, an inviting grin came to his face as the crowd began the first of many excited rounds of applause. Campbell’s on stage presence was the embodiment of confidence as he sang his tunes while gingerly strolling from each side of the stage reacting with fans as they sang along. Campbell’s music reflects a living time capsule from a simple period in American history. His low-key musical style connected with millions of fans leading to several awards including eight Academy of Country Music awards, nine Grammy awards and his lifetime achievement award and tribute this year. 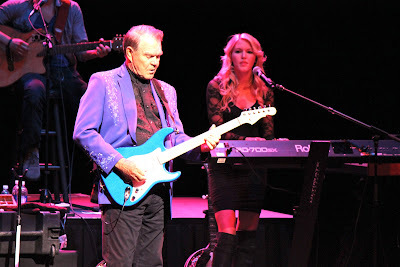 During the highlight of his music career, he was also given his own television comedy variety show called “The Glen Campbell Goodtime Hour.” This was a prime time show during a period when Americans had only a handful channels to choose from. For Campbell to star in a successful series when the airtime was so limited demonstrates the level of popularity of one of the most prolific entertainers of his day. “The television show was good family entertainment and had great music,” said audience member Alan Nitchman. Many families, especially in the South, would all gather around the only T.V. in the house, and watch Campbell’s show together. As Campbell continued to power through the upbeat show, his confidence and strong stage presence appeared completely natural and at ease. A momentary glimpse of the insidious Alzheimer’s disease was visible in between songs when signs occasionally were glimpsed of the tragic illness that is slowly stealing his mind. The signs of advanced level Alzheimers were clear to everyone a few songs into the performance due to small confusions by Campbell. He openly joked about his minor mistakes with an enthusiastic optimism that conveyed his bravery while confronting this condition publicly. Campbell would quip “Well, I make mistakes and I’m not perfect, but at least I will admit it.” This would ease the tension with joyful laughter and encouraging applause from his fans. Last year Campbell came out publicly with an admission that he is suffering from Alzheimer's disease, and has been for several years. His admission prompted this “Goodbye Tour,” because this cureless and infamously mysterious condition erodes connections between his brain’s nerve cells and steals Campbell’s time on this earth. “We are so proud of Glen Campbell for coming out and telling America he has this disease,” said Joan Giovanni, a development manager from the Alzheimer’s Association, presenting information at the event. “It’s been so many years since we have had a national champion who's been inflicted that people can look to and relate to.” Several individuals at the show that night shared personal stories with Giovanni about family and friends facing Alzheimer's and coping with mental illness. When it comes to musical ability Campbell still shines as bright as ever. Just like the love for his family, Campbell’s love for music is fully expressed with great passion and fluidity. He can still sing pitch perfect high and low with a refined control and structured melodic progression. The quick picking solos he is well known for are as tight and refined as ever, brilliantly displayed during a thrilling duet of the song “Dueling Banjos” with his daughter Ashley Campbell. The crowd clapped along till the pace accelerated to a breakneck speed, all the while Campbell and daughter didn't miss a beat. The family support aspect is another poignant part of this farewell tour. Along with daughter Ashley on keyboards and banjo is Campbell’s sons Carl on drums and Shannon on guitar. Along with a few others in his band they sang backup vocals with fitting accompaniment giving a supportive family band atmosphere. 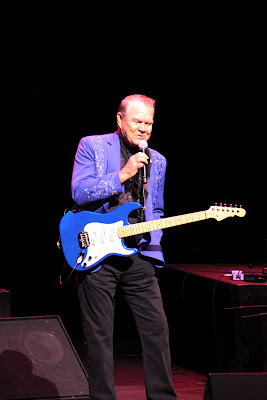 Campbell continued to thrill the crowd as the show went on with enthusiastic cheers following each song. His main chart-topping hits were saved till near the end with the song “Wichita Lineman” from the multi-platinum selling album by the same name followed by Glen’s other hit, “Rhinestone Cowboy.” Fans cheered, sang along, and even danced around while hearing these classic crowd-pleasers. The appreciation was shown by the Melbourne audience who gave Campbell repeated standing ovations and long, boisterous rounds of applause. “I am just so pleased to finally see him perform live, and now I’m so grateful that I was able to see one of his final performances,” said audience member Kim Morgan. Many fans like Morgan traveled from miles from all around central and southeast Florida to see Campbell in Melbourne. A few dozen fans gathered after the show at the exit located at the side of the King Center for a chance to see and wave goodbye to Campbell’s tour bus as it left the venue. This shows the true dedication of his fans that will surely find solace in knowing they were able to see this accomplished man perform one last time. Nearing the end of this tour for Campbell and his family, its been a bittersweet long goodbye. Campbell showcasing his children is a fitting end for his career in music and focuses on what the future holds for them.